It's been a full week here in California. 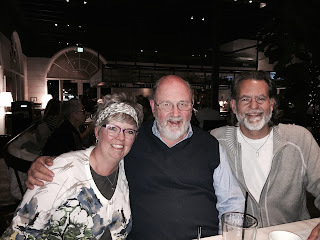 It's been a blast getting to talk about my book with people like Greg Boyd and Tom Wright. A highlight was Fortress Press taking Tom and I to dinner one night. At dinner I made sure Jana got to sit beside Tom. Why? Because everyone loves Jana. It's not that I'm socially inept or anything. I'm affable. It's just that Jana is so warm and delightful. A few year's ago when I was at a conference with Walter Brueggemann Jana and Walter completely hit it off. They were thick as thieves by the end of the conference. I knew that would happen again with Tom. Because it always happens. Jana and Tom talked a lot about his work as a pastor and bishop, especially about walking alongside those going through grief and loss. They also talked a lot about Jana's work as a theater teacher. They compared family photos and talked family. Once, when I was visiting my friend Kristi at her assisted living facility, Jana was with me. One of the men living there came up and said to her, "I have to say, Miss, that you're a little bit magical."